Eeeep! I have a journal Bible! This is one that I have wanted for quite some time. Last Christmas I bought each of my girls a journal Bible and I have felt left out ever since. So naturally when this beautiful Bible came up for review, I jumped right on it! This version is the NIV Holy Bible. It contains the full text of the Bible in the NIV translation. Each page includes the text on one half of it and lines for journaling on the outside edge. Plenty of room for drawing, doodling, writing, and decorating my thoughts about special passages. The cover is a beautifully decorated hardcover. The picture really doesn't do the Bible justice. The gold is shiny. 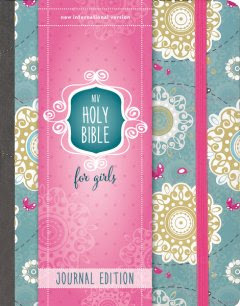 I really think maybe this Bible was meant to be for younger tween/teen girls, but I have claimed it, and I love it! The pages are just a bit thicker than usual to accommodate several types of art media. So far I have used gel pens in this Bible and they have not bled through. I have also used washi tape on the pages and it goes on smoothly and doesn't wrinkle the pages. I also appreciate the elastic strap that can be used to keep the Bible closed. Once you fill the Bible with your thoughts, ideas, and some decorations, it is useful to have the elastic strap to keep it all together. I am so looking forward to more journaling in this Bible. There is plenty of room to take sermon notes on Sunday as well as write out my thoughts and prayers during devotion time. At first it seemed odd to me to be marking in the Bible, but this is an excellent way to connect with passages and really understand what God's word means to me personally.